Titanfall developer Respawn finally shared its first look at Star Wars Jedi: Fallen Order over the weekend. As the first single-player Star Wars game in some years, it’s safe to say fans are pretty excited, and the moody reveal trailer didn’t disappoint. As previously reported, Jedi: Fallen Order is set between the events of Revenge of the Sith and A New Hope. We’ll play as a young Padawan called Cal Kestis, played by the excellent Cameron Monaghan (who you might know from Gotham). As one of the only Jedi-in-training to survive Emperor Palpatine’s devastating Order 66, Cal now lives out his life trying to blend in and avoid detection in a world where he’d be killed on sight. Obviously, his attempts to stay hidden don’t last forever. Check out the trailer below. The most important thing to note right from the start is that the game looks absolutely stunning. While we didn’t really see any gameplay, Respawn did confirm everything in the trailer was in-engine footage, meaning this is set to be one incredibly pretty game. It was also confirmed that this is a true-blooded single player adventure, which means no microtransactions at launch, or ever. It’s a little sad that this is something that needs confirming, but there you go. As the trailer starts, we meet Cal on a planet called Bracca. This is one of the several new world’s Respawn has created for its game, and it has the whole “weathered industrial” aesthetic that the movie franchise does so well absolutely down. As I mentioned, Cal spends his time on Bracca working what seems to be some kind of labour job which involves salvaging parts from old Empire crafts. In the trailer, we see him removing a pretty large segment from an old Star Destroyer. Cal appears to live his safe but fairly unremarkable life until one of his buddies gets into an accident at work, forcing our hero to expose his powers. This brings the unwanted attention of the Empire, and the Second Sister, a fearsome Imperial Inqusitor whose favourite hobby is hunting down and killing Jedi. 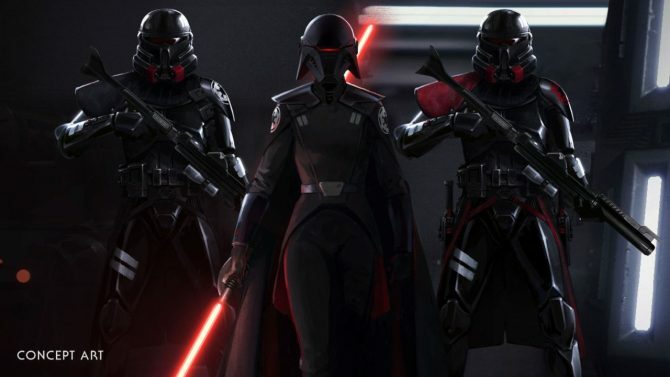 Respawn’s Vince Zampella confirmed that the Second Sister will be a dangerous and powerful foe, implying that she’ll likely be the main antagonist for the majority of the game. We also see Purge Troopers, who are an early version of the Dark Troopers from Rogue One. As Cal finds himself on the run, he’ll have to blend in when he can (with one shot of him in a crowd implying that we’ll be seeing a few Assassin’s Creed style stealth elements woven into the story). Speaking of Assassin’s Creed, we get one brief glimpse of Cal rocking some parkour skills. It sounds as if combat, force powers, and free running will be combined to create some pretty interesting set pieces. Anyone that’s played Titanfall will of course know that Respawn know how to create satisfying parkour mechanics. The team at Lucasfilm have been amazing collaborators, helping us explore and further develop this part of the timeline where the Empire is at the height of its power and any remaining Jedi are in hiding. Within this narrative, we’ve crafted a game with intense, yet thoughtful and fun melee combat using the lightsaber and Force powers, allowing anyone to fulfill their Jedi fantasy. Combat certainly looks like it’ll be all about fulfilling the Jedi fantasy, with a couple of intense looking one-on-on duels in the trailer. While we didn’t see the lightsaber in action much in the trailer, Respawn confirmed it’ll be part of a “thoughtful” combat system, described as easy to learn but difficult to master. Players will use their Jedi training to create different melee combinations with an innovative lightsaber combat system and Force abilities. Players will also use traversal and other platforming abilities to strategically overcome opponents and solve puzzles in their path across this galaxy-spanning adventure. It was also confirmed that your lightsaber will “evolve” over the course of the game. While it wasn’t made entirely clear how, this seems to gel with previous speculation that we’ll be able to upgrade and change our weapon as we progress. We won’t just be meeting people who want to kill us over the course of our adventure, either. Cal will meet a wide cast of characters, including a mysterious former Jedi Knight Cere, and a handy droid friend called BD-1. While we don’t know much about either character yet, BD-1 looks like it’ll be a pretty invaulable tool in Jedi: Fallen Order. It seems to me the little guy is mostly on hand to scan items and artifacts, providing background lore on the worlds Respawn have crafted. Also in the trailer, we see Cal take a holographic message from a dead Stormtrooper, which BD-1 then plays. Perhaps Cal will be pilfering Empire intel to get to surviving Jedi before the Empire do? Finally, the release date. 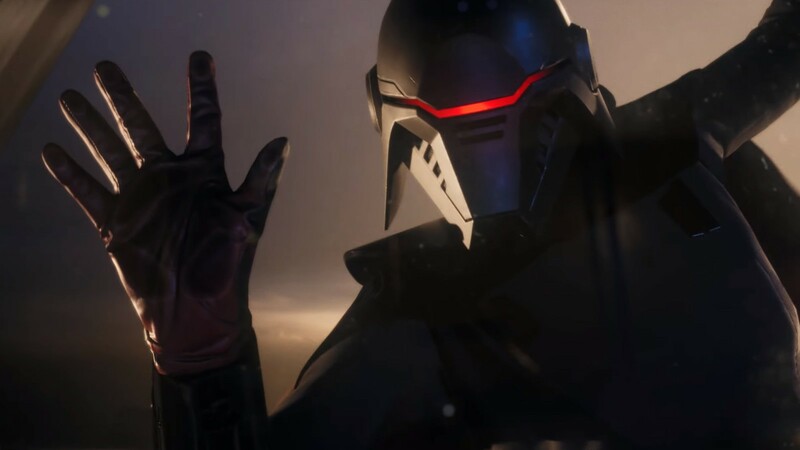 Star Wars Jedi: Fallen Order is coming to PS4, Xbox One, and PC on November 15, 2019. There’ll be standard and deluxe editions, with the latter coming with some exclusive DLC, and behind-the-scenes features.